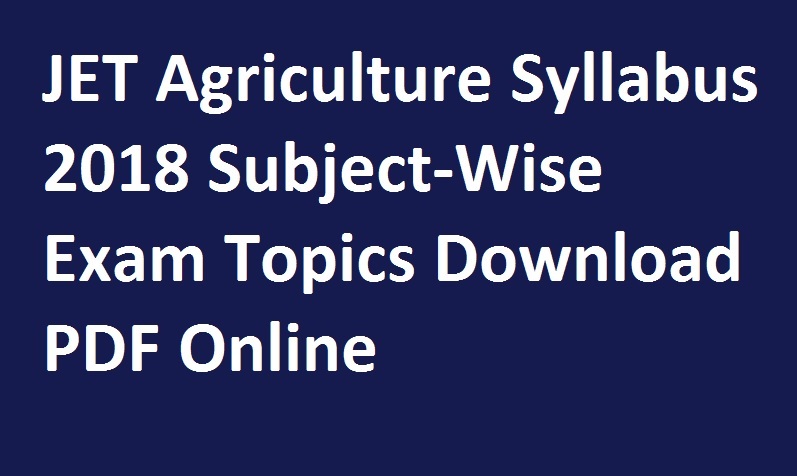 Syllabus of JET agriculture comprised for all offered courses in the university. In the below section we have provided subject-wise syllabus of JET. The candidates are advised to go through the complete syllabus of Rajasthan JET that is prescribed by the university. It covers all the topics of the syllabus. Below candidates can check the topic-wise syllabus for all courses and prepare for exam according to it. General proficiency and general knowledge in Agriculture, Pulses-Green gram, cowpea, pigeonpea, black gram, kidney bean, gram and pea, Oil seeds-Groundnut, sesame, soybean, mustard, linseed, safflower, sunflower and taramira, Cash crop-Sugarcane, potato and tobacco, Fiber crops-Cotton and Sunhemp, Fodder crops-Berseem, lucerne, oat, cluster-bean and pearl millet, Spices-Fenugreek, cumin and coriander, Characteristics of quality seed, seed germination and factors affecting it, Seed production-nucleus, foundation and certified seeds, Dry farming-importance, characteristics and principles, Crop production technology in dry farming areas, Mixed cropping, its types and benefits, Crop rotation, its principles and advantages, Tillage: objectives, primary and secondary tillage, Sowing methods, Seed treatment, seed dormancy and ways to remove it, Importance of fruits and vegetables production, Importance of livestock in agriculture. Unity of Life, Continuity of Life, Plant Physiology, Environmental Biology, Botany and Human Welfare, Invertebrates, Vertebrates. Algebra of complex numbers, Relations and functions, Matrices, Vector, Co-ordinate geometry: Circle, Parabola, Three Dimensional Geometry, Probability, Function, Limit and Continuity, Differentiability, Derivatives, Application of derivatives, Successive differentiation, Methods of Integration, Integration of functions, Definite Integral, Quadrature. Dynamics of a particle, Rotational motion, Heat & Termodynamics, Thermodynamics, Radiation, Waves, Wave Optics, Electrostatics, Kirchoff’s Laws, Magnetic effects of current, Electromagnetic Induction, Alternating currents, Electromagnetic waves, Photo Electric Effect and Matter Waves, Semiconducting Electronic Devices. Joint Entrance Test will be conducted through offline mode (pen and paper based mode). In Rajasthan JET exam there will be total 200 questions asked in the examination. At the time of exam, candidates are required to use only black ball point pen to answer. On every correct answer four marks will be provided. One mark will deducted for each wrong answer. Negative marking will also be done for multiple marking. 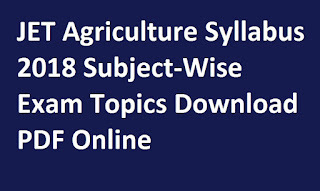 Candidates may get the JET Agriculture Syllabus 2018 through this page which is provided above or you can check Official Link. You can follow us on Facebook and Google Plus too. You can get latest details via email by just subscribing our free email service. All of you are suggested to keep in touch with us for getting up to date details.